Wish I'd Known About this Novella Earlier! 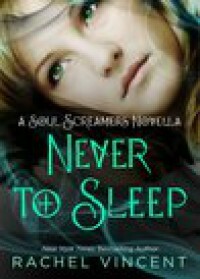 I wish I'd known about Never to Sleep back when I first read the Soul Screamers Series. It was a really enjoyable quick read and gave a lot of background on Sophie, a character I always wished I'd known better. Note: There are spoilers for book 1 in the series in this review. Getting into the head of Sophie, Kaylee's cousin, was great! She's not anyone's favorite character I imagine, because she's fairly shallow and really mean to Kaylee. But I know that by this point in the series, I also felt kind of bad for her. Her mother died extremely suspiciously and all kinds of crazy things are constantly happening around her and to her - but no one has deigned to explain to her why. She may not be a banshee, but she deserves to know what's going on IMHO! Well, just like Kaylee - no one's going to tell Sophie until she gets herself into heaps of trouble and finds a cute boy to spill the beans. In this case it's necromancer Luca - who you'll get to know better in book 6. I found that Never to Sleep explained so much about their relationship and some of the changes you'll see in Sophie in upcoming books - I really think it's a must read for fans of the series. I loved seeing Sophie confront this world she's been teetering on discovering for so long, and to face it with the same kind of strength that I've come to admire in Kaylee. And she had a great sense of humor that made reading Never to Sleep lots of fun. Well, the only thing I have a problem with in Never to Sleep, I had a problem with in the series in general. Sophie is not a Banshee. Her scream is not a Banshee's scream. This has been firmly established. She's not the first daughter of a Banshee and human ever - so why is she the first one we've ever heard of that can scream and end up in the Netherworld? It just doesn't work for me at all, even if I do like the changes it brings about in Sophie and the story. It just doesn't jive with the mythology already established in the series. I really enjoyed Never to Sleep and definitely recommend you read it if you're reading the Soul Screamers Series - or if you're a fan that missed it like I did the first time around!